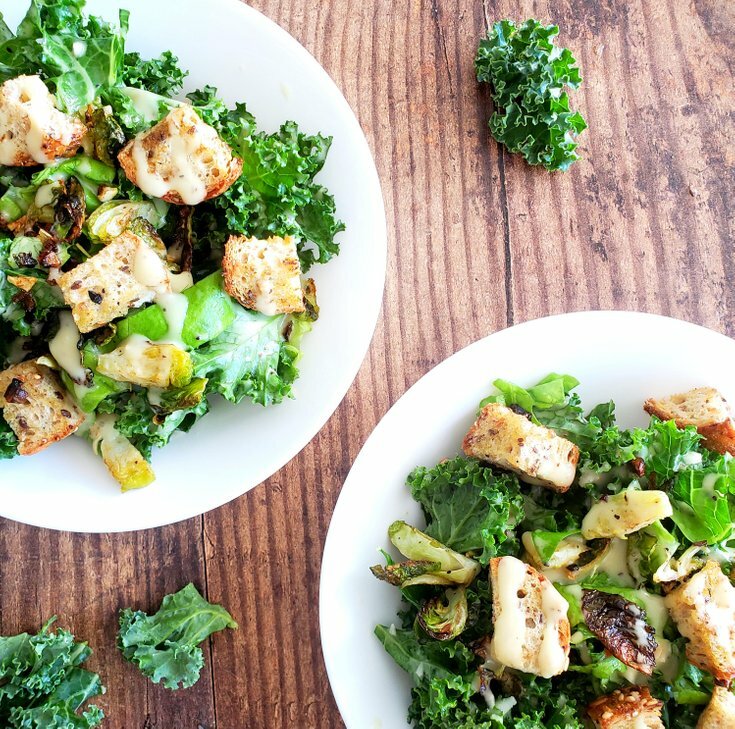 This vegan Kale Caesar Salad is made with crisp kale & lettuce, homemade croutons, & Brussel sprout bacon. Impress your dinner guests with this salad recipes today. Non-vegans will argue that you can't have a Caesar salad dressing without yolks and anchovies, because how else would you get that "richness" and "briny" flavour? Well, it turns out you can get all those flavours without using eggs, dairy, soy, or anchovies, but instead by using plants. Next, cut around 2-3 slices of bread into small bite-sized cubes - about 1 1/2 inches by 1 1/2 inches. You can use some stale bread you have laying around the house or freezer, or a couple of slices of fresh bread that has a thick crust. Then, toss the chunks of bread with the olive oil, salt, and pepper. Cook for about 5-10 minutes or until the bread is lightly browned and toasted. Set the croutons aside to cool. For the Brussel sprouts, de-stems, then cut into quarters. Some of the leave will fall off, but that's okay. Toss everything with the liquid smoke, minced garlic, maple syrup, salt, and pepper. Next, cook in the preheated oven at 400° F for 20 minutes, or until charred. 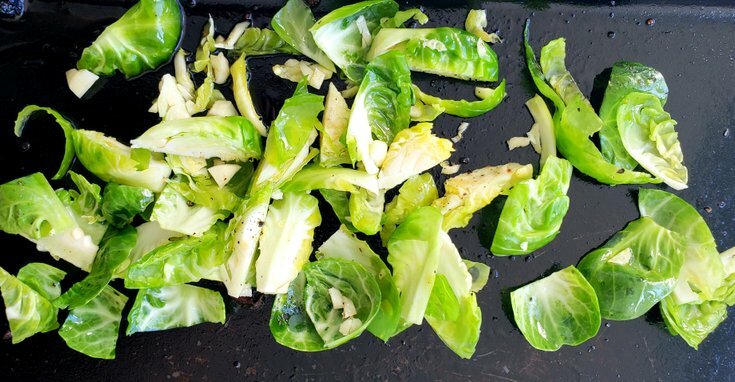 Once charred, set the Brussel sprouts to the side to cool. Now time to prepare the kale and lettuce. 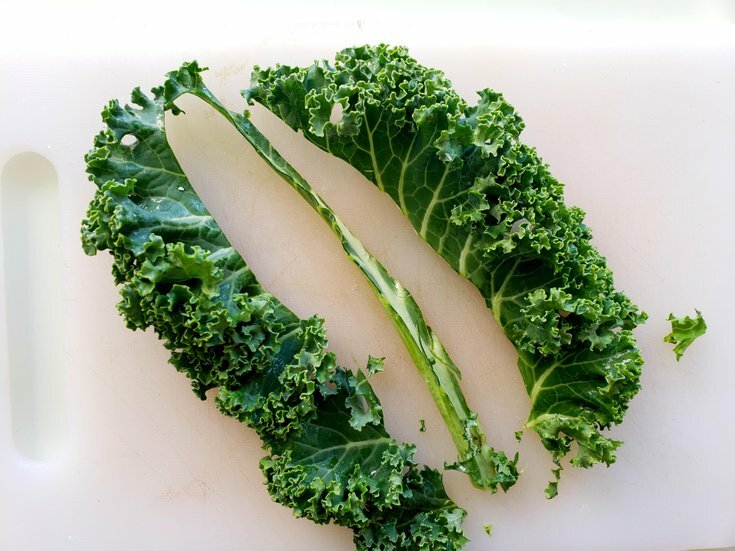 Start by cutting along the stem and leaf of the kale to remove the rib. Do this for all 4-5 stalks, then discard the ribs. 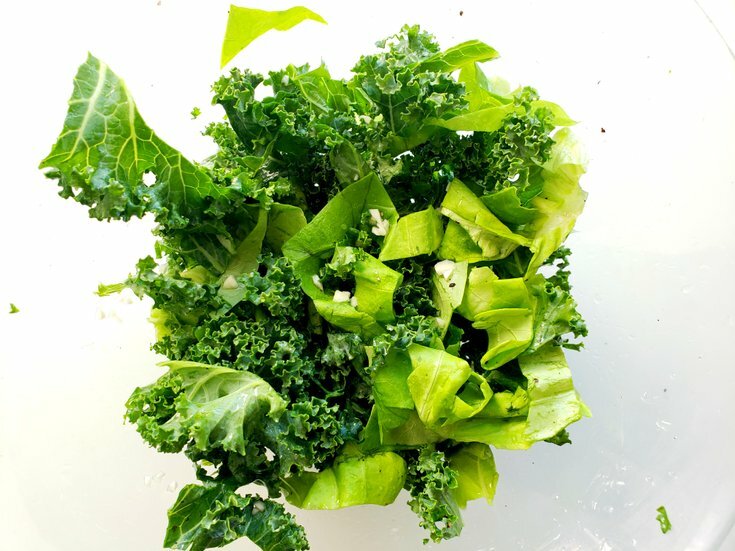 Next, roll up the kale leaves, then slice them into small bite-sized chunks. Add the chopped kale and lettuce to a large serving bowl. Depending on what salad dressing you use, will determine how much garlic or lemon juice to add. So, add the dressing, taste test, then add the minced garlic and lemon juice accordingly. I say this because I picked up a new salad dressing in the grocery store and added lemon juice and garlic like I regularly do, and to my surprise, the salad tasted like a lemon. Now I taste test! 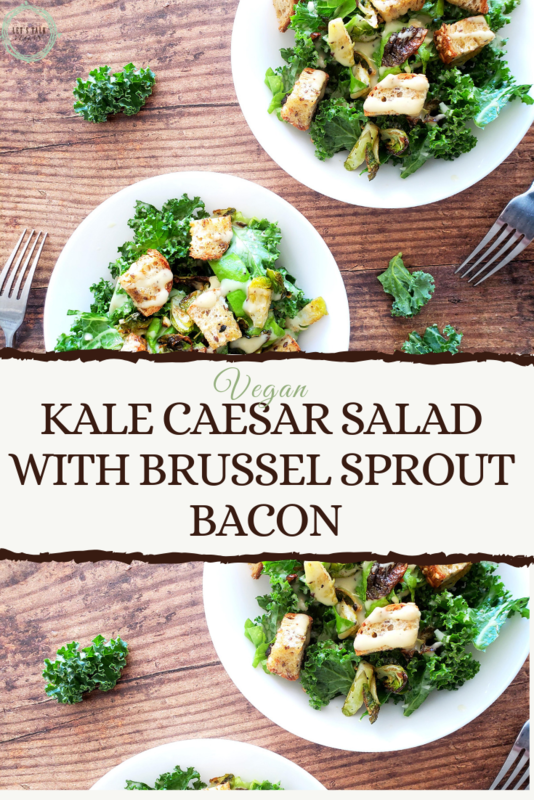 Finally, sprinkle the Brussel sprout bacon and homemade croutons over top of the kale caesar salad and enjoy! Note: Take a paper towel, run it under some water, ring it out so that it's just damp, place over top of the salad, then place in the fridge until you're ready to eat it. This will help keep the lettuce and kale crisp and fresh. Cut the bread into 1 1/2 inches by 1 1/2 inches. Toss with olive oil, salt, and pepper, then cook for 5-10 minutes or until bread is lightly browned and toasted. Cut the stem off the Brussel Sprouts, then cut into quarters. Some leaves will fall off, that's okay. Toss in liquid smoke, minced garlic, maple syrup, salt, and pepper. Cook in preheated oven of 400° F for 20 minutes or until charred. Set aside. Cut along the stem and leaf of the kale to remove the rib, discard. Roll up the remainder of the kale, then slice into small bite-sized chunks. Add to a large bowl. Chop the lettuce and add to the bowl. Next, toss with the salad dressing. Some dressings have A LOT of garlic and lemon juice, so taste test, then add garlic and lemon juice accordingly. 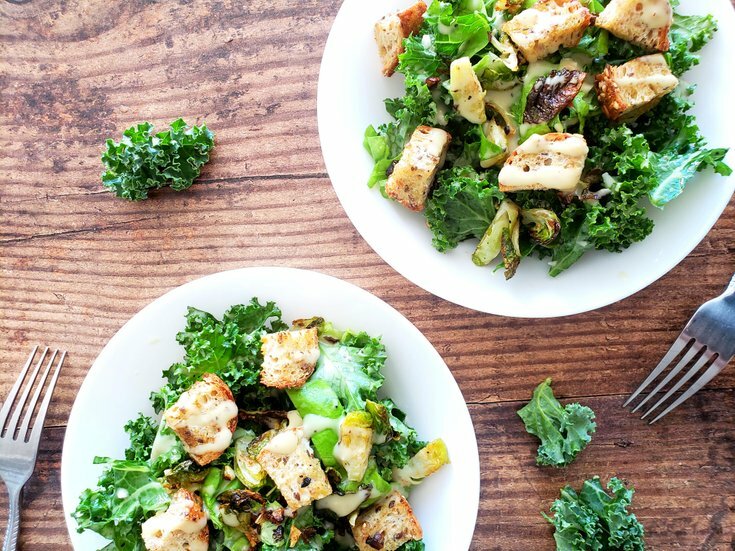 Sprinkle the Brussel sprout bacon and homemade croutons over top of the kale salad. Enjoy!